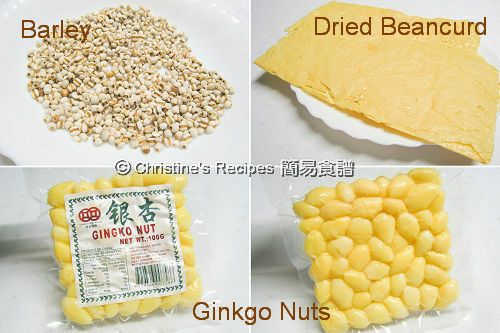 Ginkgo Nuts are very popular ingredients for Chinese cooking, whether it be added into congee or dessert. Here’s a traditional Chinese dessert, Dried Beancurd and Ginkgo Nuts Dessert, requested by my reader to translate it from my Chinese food blog for her. 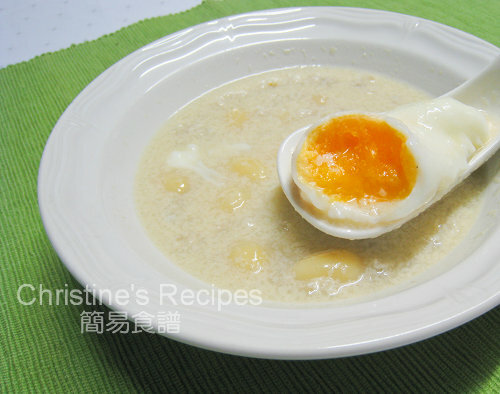 This dessert is very easy to make, very popular in Chinese home cooking. The outer hard shells of ginkgo nuts that I bought from an Asian grocery were already removed, which were packed in a plastic bag placed in a fridge. The cooking time of the dried beancurd depends on how you like it. Some people like it cooked until completely dissolved, that looks like soy milk, others like them reserving some bits and pieces. This dessert can be served hot or cold, suitable for all seasons. Rinse the barley and the ginkgo nuts. Soak barley in water for about 30 minutes. Rinse dried beancurd. In a separate bowl, soak dried beancurd until softened. Put the barley and the ginkgo nuts into boiling water. Cook over medium heat, covered, about 30 minutes, or until all ingredients are softened. Add the softened beancurd. Continue to cook until it breaks into pieces, or cook until it turns into soy-milk-like mixture. (Note: After adding beancurd, it easily spills over the stove. Be careful.) The cooking time depends on how you like it. Add rock sugar and cook until completely dissolves. Taste by yourself. When the dessert is almost done, you can add eggs and cook to your preferred texture. I just broke the eggs and added into the dessert, immediately turned off the heat. Let the heat in the pot continue to cook, about 5 minutes, then I got soft-boiled eggs in the dessert. Really enjoyed! Everytime when I ask my mum what are these called, she said 'Pak Ko, Yee Mai, Fu Chuk, Gai Tan, Tong sui' and that's exactly and essentially what that goes into making it. Might sound very silly but I didn't realise till I started learning how to cook that these are so so easy to make!!!! I've never tried using GInko nuts for cooking before - sounds like a must try! Can't remember when I last ate this...seems ages ago...looks so tempting! Preparing gingko nuts is seriously painful I use packet ones as well. Every one I know seems to like this dessert and it is very popular here in H.K. But excuse me, when it comes to the ginkgo nuts, I'm a bit picky as I always bias toward those come with shells : ). I've cooked with all the ingredients in this dessert, but never combined it to make a dessert. Thanks for sharing this. You're welcome. Enjoy your dessert! I enjoy using ready ginkgo nuts like this. Hardly see soft-boiled eggs served in this dessert. Good addition! This recipe intrigues me, I've seen ginko nuts before but had no idea of how to use them. I now have no excuse, and it looks delicious. You've hit the spot! This is my fave tong sui! I prefer this to azuki bean soup! I wanna make this for some time, but recently I could not find the Ginkgo nuts here anymore, have to wait see if they will restock again. Thanks for translating this recipe! And those Ginkgo's are not only good for the skin, but also for the brain. Nice dessert, ty for sharing. But how do I get the soy milk texture? Just soak it until softened and boil it longer, then you'll get the creamy texture. I tried your recipe above but can't seem to get the beancurd sheets to breakdown (melt in the mouth texture). FYI, i bought the beancurd sheets for desert (confirmed with the lady at the market) and have soaked it overnight. I boiled the soaked beancurd sheets for an hour and a half but the texture is still a little rubbery. Not sure where i go wrong. Some advise would be appreciated. Sorry, no idea why your beancurd sheets couldn't be broken down. Mine always does very well. Mine also become rubbery? Still cannot find the reason. Could be something wrong with the product. I have tried several times with the beancurd but failure. Is it because I didnt soak the beancurd sheet. What do you mean by "failure"? It didn't break down or melt properly. Is that what you meant? Yes, you need to soak the beancurd sheet until softened before cooking. I found some brands of beancurd sheet out there aren't easily broken down even after long hours of cooking. Well, it's not a problem, as it still can be eaten. The dessert still tastes good, only the texture is not up to expectation.